Over 90 entries cruised through Edgefield Sunday afternoon, a parade that lasted close to two hours and ended with Santa Claus greeting children under the Christmas tree on the square. There were three judges — Sam Crouch, Tony Frazier and Maggie Williamson (new to the community, now the director of the Piedmont Tech Pottery Center) – and two soloists (Joe Bolden and a fourteen-year-old STHS student) whose voices rang out through the huge audience; and emcees, former Miss S.C. and motivational speaker Jane Herlong and popular D.J. and Director of the Edgefield Parade Calvin Henderson were on the grandstand. The emcees kept the parade moving with some hilarious comments and identification of the heads of the floats moving before them. The pace was just right for all to see and hear the music offered by multiple groups including a number of bands – from Fort Gordon, Strom Thurmond High, McCormick High School and Ridge Spring- Monetta High. RS-M, followed by Ridge spring Fire Truck and firemen, were early in the parade as they had to go on to Ridge Spring for their tree-lighting ceremony Sunday evening. 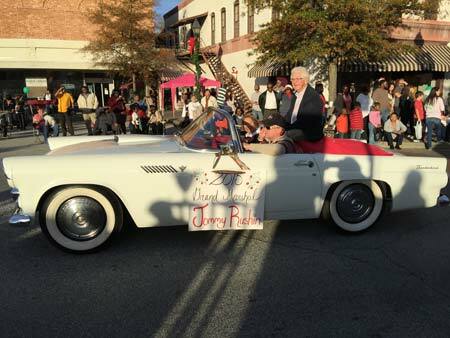 As usual schools were represented, politicians were “afloat,” as was the Grand Marshal, retired pharmacist and special Edgefield citizen Tommy Rushin. He was accompanied by his wife Betty, and Tommy no doubt stirred the envy of many an antique car buff as he was driven in his own 1955 T-Bird that he had restored just in time for the parade.